Anyone know which vacuum advance control pod to use as a replacement in my DZ 302's 480 distributor? Yup - use a NAPA/Echlin VC-1810; it starts moving at 4" Hg., and is fully-deployed at 8" Hg.. Don't connect it to the stock distributor vacuum port - that's "ported" vacuum (no vacuum at idle). Cap off the port and tee the distributor line into the choke pull-off diaphragm hose - that's full manifold vacuum. Thanks John, found a link in Team Camaro mentioning the VC-1810/B28, same one I assume? It does however call for VC-680/B1 for the 69-70 302, not enough vacuum early enough with the B1? What about springs while I'm at it? Any '67'-'69 Z/28 should use the VC-1810, as all had the "30-30" cam and only produced about 9"-10" Hg. vacuum at idle, thus needing a vacuum advance that's fully-deployed at 2" Hg. below that. The '70 Z/28 used the LT-1 cam, which produced more vacuum at idle. Spring usage can only be determined by curving the distributor on a Sun machine - the "curve kit" springs vary a lot. The VC-1810 is ideal but NAPA tells me it is NLA. I'm wondering if anyone has used and noticed that the B28 only gives 10 degrees of advance.I altered one to replace a 355 to give the full 15 degrees.Steve. There's a fair amount of variation to specs in all of the vac cans - it's a good idea to check them out with a Mityvac; they should add 15*-16* of advance. Didn't GM engineer the distributor spark advance to be connected to a ported vacuum source? full advance at idle and diminishing spark advance as rpm increases and manifold vacuum decreases? vacuum advance work together to provide a total spark advance according to engine needs. Read John's info under "Maintenance" Page 11. The smell of fuel at idle seems to be gone,and a noticable differance in earlier power. What have you had to tweak? I have not touched anything yet after doing the vacumm line changes John mentioned. Initially all I did was switch the v. line and as you said I too noticed an increase in lower rpm power and responsiveness. And through the entire curve for that matter. The tweaks I mentioned I have not done yet. They pertain to an off idle stumble.John's v. line suggestion helped this as well. Which I was able to also improve with timing, dwell and mixture adjustments. Finite tuning adjustments are areas that I do not possess extensive knowledge. And my motor is a far cry from the high-perf. 302 ( Only a 327 standard bore .010 over, stock pistons, 63 vette heads, mild cam, hyd. lifters, 69 GM Z/28 intake, 670 Street perf. 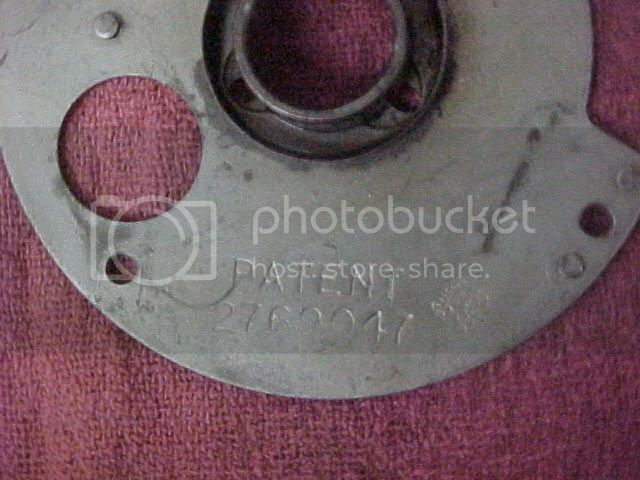 carb., stock exhaust man., 2/12 in. exhaust. Scott. Yes, ported spark was the design condition, as a crutch for emissions. Yes, the full manifold vacuum connection provides full advance at idle, which is EXACTLY what you want. My "timing 101" paper below explains how timing and advance work together, and explains the "ported" vacuum aberration. AutoZone sells them as # DV1810, $12 and no additional shipping or freight charges if ordered from a local store. You'll get it in 2-3 business days. The now-discontinued NAPA/Echlin VC-1810 vacuum advance unit, stamped "B28", is also available now as GM #88924985, AC-Delco #D1312C, available from GMPartsDirect.com. I bought a bunch of them in November. Thanks John, I actually walked into the local AC Delco distributor and gave the D1312C number you provided and the service guy told me I wouldn't see it for about a month. Fortunately I found the AutoZone part number and after I picked up the first one last night and confirmed it was a B28, I ordered a 2nd one which I should have by Saturday for my original 480 which will remain on the shelf even though i completely cleaned and reserviced it including reskinning so it looks great!! oh well. BTW, picked up a small tube of moly grease for the grease well at a local hobby shop for $5. As for the B28 I picked up last night, stuck it in my DavesSmallBodyHEI this morning which although I specified 6"-8" of idle vacuum when I had Dave build it, he supplied with a B26 can, (VC1808 or same as VC1765/B20). so with full manifold vacuum the engine would hunt around and idle would surge and drop and hunt and... you get the picture. Because of this for the last year, when I put Dave's SBHEI in service, I've had it hooked up to ported vacuum. So, like I said, Installed the B28 this morning, reinstalled the distrib, set static timing to 8*, hooked up full manifold vacuum to the can and the car runs great!! Crisp throttle response, stable idle, significantly less to nill gas fumes in the passenger compartment... nuff said!! So with 8* of initial, total timing @ 3200 rpm is 37*. could probably stand some more initial but runs great and starts right up as set now so there it will stay!! As I understand it, the vacuum choke pull-off is designed to partially open the choke plate when vacuum develops (just after the engine starts), to prevent an over-rich idle. I believe the pull-off also helps prevent the choke plate from snapping closed under the vacuum draw down thru the venturi (front two primary barrels) until the thermostat choke spring heats up and fully opens the choke. With your choke pull-off blocked off, do you experience rich fuel starts or problems with the choke plate from closing until it is fully open? Did you make any other modifications to prevent this condition? JohnZ, With your choke pull-off blocked off, do you experience rich fuel starts or problems with the choke plate from closing until it is fully open? Dave - My choke pull-off isn't blocked off - I'm just sharing its vacuum source for the distributor, using the same tee the production arrangement used for the diverter valve signal hose. That tee came already installed on the carburetor - see UPC 6, Sheet C8, View "A" in the Assembly Manual - you'll see the diverter valve signal hose (item #15) being connected to the tee. To clarify - you removed the diverter valve signal hose from this T-fitting and rerouted the distributor vacuum advance hose in its place, correct? Is your diverter valve signal vacuum hose now inactive, or what did you do with this hose? Related to this topic, I recall from a previous discussion topic, where some people are now internally modifying the A.I.R. 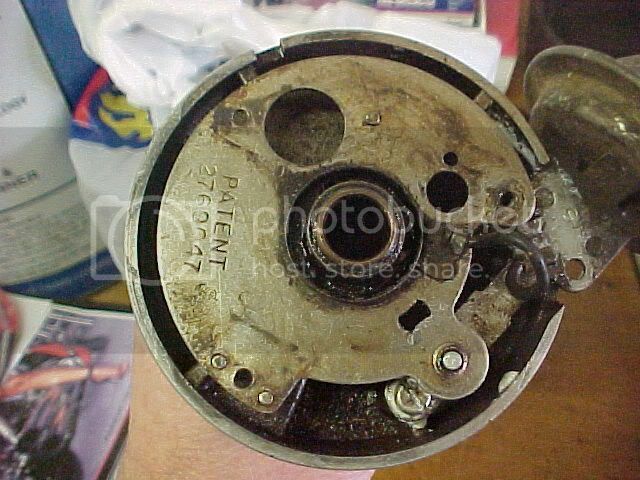 pump (during pump restoration) to defeat its function, yet retain the pump to function as an “idler pulley” to keep a stock look under the hood. Thus, the diverter vacuum hose would serve no purpose other than for looks. This hose could be internally blocked off and pushed into its original location. It’s tucked under the air cleaner and not visible to the casual observer. Then for a “points” show, the two hose can be easily swapped back to their correct locations for judging purposes. Does this sound feasible? Am I forgetting anything? If the A.I.R. pump is defeated but retained as described above, ideally, should the A.I.R. extension tubes be shorten and pinched closed to get them out of the exhaust air flow path? P.S: Sorry for belaboring this…this could be another topic. Thanks in advanced for your input. Boy I sure enjoy John Z when he answers a question. I'd love to spend a day or two with you just picking your brain, but I'm afraid I couldn't handle it. Thanks for all the helpful information over the years. Related to this topic, I recall from a previous discussion topic, where some people are now internally modifying the A.I.R. pump (during pump restoration) to defeat its function, yet retain the pump to function as an idler pulley to keep a stock look under the hood. Thus, the diverter vacuum hose would serve no purpose other than for looks. This hose could be internally blocked off and pushed into its original location. Its tucked under the air cleaner and not visible to the casual observer. Then for a points show, the two hose can be easily swapped back to their correct locations for judging purposes. this could be another topic. Correct - my diverter valve signal hose has a BB in it so it's plugged and inactive whether it's connected to the tee or not. The diaphragm in most diverter valves has failed, and that becomes a massive vacuum leak; in a functional A.I.R. system, a failed diaphragm also defaults the valve to the open position, pumping air into the exhaust system 100% of the time, which causes "afterfiring" or "popping" on overrun. My A.I.R. pump is "gutted" (vanes removed), so it just serves as an idler pulley. I also removed the extensiion tubes in the exhaust manifolds and replaced them with #10 x 1/2" flat head machine screws; that plugs the holes (to keep hot exhaust gases out of the air manifolds so the hard-to-duplicate finish doesn't get burned off), and the tube nuts on the air manifolds end up in the same position as they did with the extension tubes in place. With the A.I.R. pump gutted, it'll last forever; the primary failure mode for A.I.R. pumps is galling of the ends of the vanes and the running surface on the housing, which results in seizure of the pump; gutting the pump eliminates the failure mode. Your recommendation on the A.I.R. pump system is what I was hoping to do as a winter project this year. The tip to use #10 x 1/2" flat head screws is a good idea to keep the hot gases out of the A.I.R. tubes so they do not discolor. That and why I was thinking about cutting off the extension tubes and pinching the tips closed, but I like your idea using the screw in place of the tubes. John, the screws are ok. The manifolds should come off, and this can be done from either the front or the back. just thread the extension holes and inset the plugs. Over time your machine screws could deteriorate and may fall into the cylinders. On the other hand with the brass plug, it becomes fused to the steel, and since the brass is soft metal it could be easily drilled out. 30 years later the brass would still be perfect, but I would feel funny about a screw hanging there in that hole. Screws should be temporary - I don't consider them a permanent solution. I use stainless flat head machine screws - the angle on the bottom of the screw head matches the flare seat for the extension tube in the manifold perfectly, and they won't corrode/deteriorate. I wanted to follow up on this discussion forum covering the “B28” vacuum advance and centrifugal advance mapping. I need tips about recurving my distributor and fine tuning the carb. 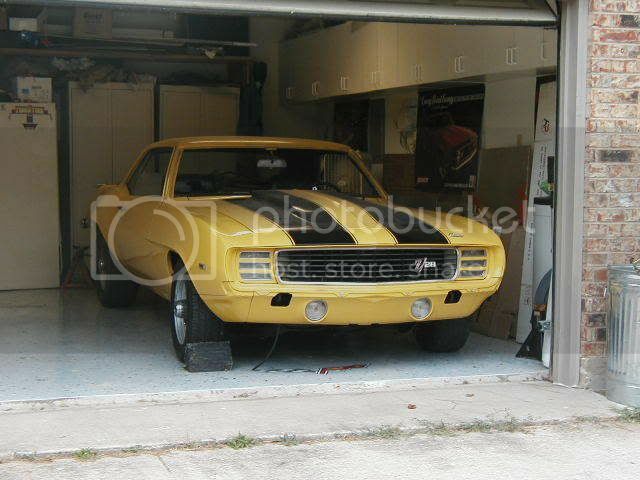 My ‘69 302 Z28 is basically stock except with a ’70 LT1 solid lifter cam, flat top pistons, so I estimate my C.R. somewhere between 10 - 10.25:1. I am using stock exhaust manifolds and exhaust system, and running a 180 degree thermostat. The distributor is a std. Delco points style distributor converted to Pertonix electronic ignition and Pertonix Flame-Thrower II high output coil. The distributor was recurved about 10 years ago with aftermarket centrifugal weights and light silver springs, but I don’t know the brand. I recently changed the vacuum advance unit from a “B1” to a “B28” and mapped the advance curve. A black advance stop busing is installed limiting centrifugal advance to 24 degrees. I recently gutted the A.I.R. smog pump and it now functions as an idler pulley and blocked off the air delivery tubes The vacuum advance hose is now connected to direct manifold vacuum, at the T-fitting located at base of carb were A.I.R. diverter valve vacuum hose was originally connected. The carb is the stock 780 Holly, List 4053, with 68/76 primary/secondary jets, #85 primary power valve and block off plug in the secondary PV side. The #85 PV was selected to opening at 8.5” Hg, or about 1” to 1-1/2” Hg below the manifold vacuum reading. I using the #28 pump discharge nozzle, and the white (weakest) vacuum secondary spring and omitted the check ball. I run 93 octane pump gas. My set-up was with the smog pump active and the vacuum advance connected to the “stock” ported vacuum source, but now connected to full manifold vacuum as stated above. Initial timing is set at 12 deg. BTDC with a +/- 0.5 degree of flutter with the centrifugal advance secured to not to influence timing. Idle vacuum is 9 – 10” Hg and idle mixture optimize to maintain 9 - 10” Hg. The B28 vacuum advance adds about 16 – 18 "crank" deg of advance, which I can adjust with a vacuum timing limiter cam from Crane Cams. Idle RPM is set to spec., at about 900 RPM. With the centrifugal advance active, the advance it is coming in too early and causing a jumpy +/- 1.0 deg or more of timing flutter at idle. The springs are too weak and need to be replaced. Idle must be adjusted down to 600 RPM to prevent centrifugal advance from coming in. At 900 RPM, 9 deg’s of advance results, checked with a dial back timing light. The centrifugal advance map curve yielded the following degrees of advance at the corresponding RPM’s, checked by dialing the timing light back to the 12 deg initial and recording the advance: +9* @ 900, +12* @ 1100, +16* @ deg at 1300, +19* @1500, +22* @ 1700, and all in at +24* @ 1900. Thus total advance of 36 deg (12 init. + 24 cent.) is all in by a very early 1900 – 2000 RPM. The overall advance totals 54 deg at cruise conditions, adding the 18 deg of vacuum advance. I may limit vac advance to 16 to get overall advance down to 52 deg. I fear engine ping or detonation during the hot summer season. Throttle response is noticeably better. During aggressive 1st, 2nd, or 3rd gear acceleration runs, the 302 power really pulls hard after 3000 – 3500 RPM to redline. At this point I can not tell if the power band is natural to my engine, the current distributor timing map, or the mapping of the Holley carb jets and secondaries. While in park and idling, stabbing the throttle to wide open, there is occasional lean condition back fire thru the carb, but otherwise no noticeable stumble. Changing the Holley primary jets from 68 to 72 will hopefully cure this lean back fire. If the goal is to have a weight/spring combination that does not come on too early, but is “all in” by 2800 – 3000, what is a recommend source for centrifugal weights and springs? What color spring or spring combination and advance map is recommended, or found to be ideal in the 302? The MSD Ignition web-site does a good job showing various advance curves with their distributor, limit bushings, and spring combinations but I am not sure if or how this translates to my stock distributor. I have read mixed results about the quality of aftermarket weights, and recommendation to stay with GM weights. 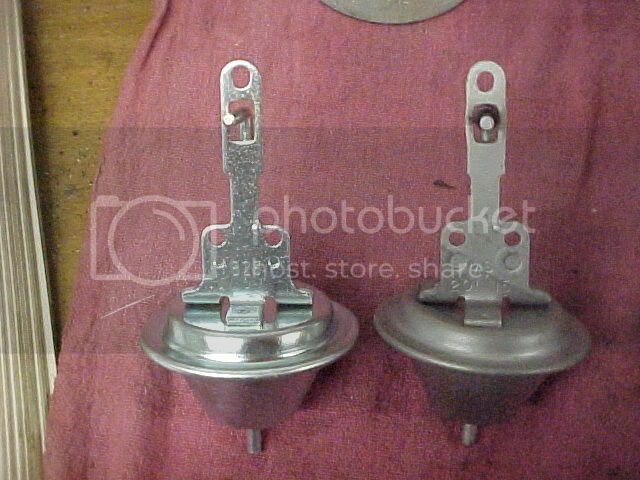 I am not having much luck finding advance bushing and advance kits locally for the old style points distributor. What Holley Carb vacuum secondary spring is recommended? Should the vac secondary check ball be retained or omitted? My goal is to find the combination of parameters for the ignition and carburetor yielding optimum performance and drivability, yet retain the stock look of my 302. Please excuse my long discussion but I suspect there are others with my same questions and goal in mind, yet have experimented with a set-up that has yield good results. Thanks and your recommendations will be appreciated! Excellent post, lots of good info to work with! Unless you've modified the carb base gasket, the vacuum port on the passenger side of the base of the 4053 carburetor is a "ported" vacuum source; that's why my "driving" setup uses the tee in the rubber hose from the front of the carb base to the choke pull-off diaphragm for the vacuum advance, which is a full manifold vacuum source (and that's where the diverter valve signal hose was connected from the factory, not the port on the carb base). The #85 primary power valve is incorrect, and is too close to the idle vacuum signal - it should be a #65, and you should have a #85 in the secondary instead of a plug; that's the stock setup, and it works. Put the check ball back in the secondary diaphragm housing - omitting it causes the secondaries to "slam" open instead of responding in a linear fashion to the airflow in the venturis. I run the stock secondary diaphragm spring, works fine for me. Get those #68 primary jets changed out to 72's and you'll feel the difference. 24* centrifugal in the distributor is on the money, but 1900 rpm "all in" is too soon, as is 600 rpm for the starting point of the curve. You can't buy a "spring kit" off the shelf that will accomplish what you want - yank the distributor and give it to a shop with a Sun machine (or send it to Jerry MacNeish) and have them set up the curve you want (start @ 1000-1100, "all in" by 3000). this thread began with a question about the vacuum advance pod for the 480 distributor. Reading the thread got me interested in following up and rebuilding my 480 distributor, so I bought a couple of the autozone PN's mentioed, and ordered a GM part (but haven't got it yet). When I disassembled my distributor, I think it had the original vacuum module on it (see photo below); can someone confirm this is the original? or at least the original PN? ... after removal, I compared the spring strength to the new autozone part, and find that the original spring tension is roughly 3-4 X more than the new autozone part... which concerns me. Is this normal? Wouldn't it require a lot more vacuum to affect a timing change wiht a high spring pressure? What gives? IS the autozone part I have too 'different'? Or is there some kind of failure of the original part that could cause this? Yes, I'm totally confused. There appears to be a slight bend in the original; could this cause the stronger spring/diaphragm pressure? I would also like to confirm that this is the original advance plate for the 480 distributor; I pulled this distributor from my car in the 70's (it was sloppy) when I rebuilt the engine and used a rev pol distributor; it's been laying under my bench since until I retrieved it to rebuild it. Thanks JohnZ. I'll get in touch with Jerry MacNeish. I don't have the Delco cross-reference for the "201 15" VAC unit to determine if it's the one originally installed on the 480 distributor - maybe Jerry does. 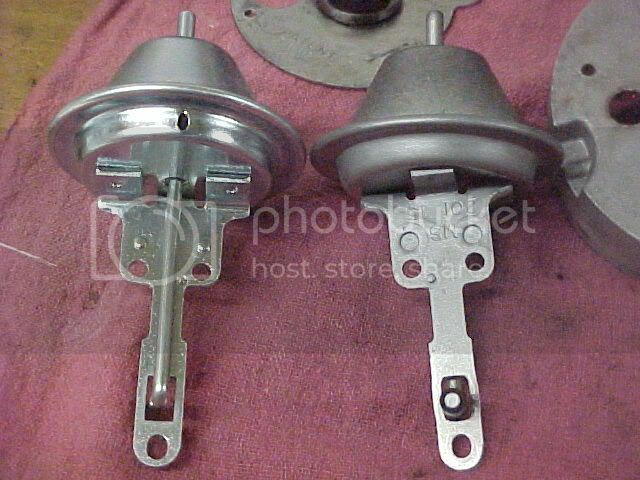 The diaphragm housing is probably bent from using it to rotate the distributor while setting timing. It doesn't matter where you buy a "B28" VAC unit - they're all the same, made by Standard Products (who bought that business from Echlin, Borg-Warner, and Dana) and re-boxed for retail distribution, including through GM (#88924985) and AC-Delco (#D1312C). Just check it with a MityVac - it should start to move at 4" Hg., and be fully-deployed at 8" Hg. ; if not, take it back and get another one. I bought a bunch of them about six months ago from GMPartsDirect.com ($6.00 each), and all of them checked out fine with a MityVac. The only issue with the B28s is they will only pull 10 degrees .You will have to elongate the slot for the 15 needed .The early deploy is wonderful,No idle fluctuations on low vac. cams .Perfect for Z28 and L/78s . Also, dial back lights are not accurate ,Timing tape is the way to go if you don't have a Sun machine handy . Steve: I think I understand that the B28 would deploy more quickly/easily based on the light spring pressure. Bye elongation of the 'slot'; are you referring to the slot in the vac pod plate that the end of the rod extends thru? elongate it on the high vacuum end-of-motion I assume...? Correct,the lighter spring inside the vac.can .And elongate on the high vac. side of the slot .It is best to check the range of advance the can gives with a timing tape, and a Mighty Vac pump instead of relying on the Vac. supplied by the engine . That hasn't been my experience - I've used lots of them on Corvettes in the last year (and I've had one on my Z/28 for eight years), and all of them, fully-deployed, add between 14-17 degrees at 8" Hg. During the consolidation from Echlin/B-W/Dana to Standard Products, some were apparently mis-identified and/or mis-boxed. They work particularly well with full manifold vacuum on '66 L-72 and '67-'69 L-71 3x2 Corvettes, which had "ported" vacuum from the factory. I must second JohnZ's experience with the B28 vacuum advance can. I recently switched from a B1 to a B28, and it pulls between 17 - 19 degrees advance at idle with my 10 - 11" Hg. idle vacuum. I had to limit it to 16 degrees with an adjustable vacuum advance limiter cam. The B28 is rated to yield 8 distributor (16 crank) degrees at 5.75 – 8” Hg, but I am sure they can vary. L78 Steve...Is it possible that something is hanging up the vacuum plate? Maybe your the B28 is not functioning properly. Last night I made the following adjustment to my Holley carb and road tested the car today. See my base line listed earlier in this discussion topic. Primary side - changed the jets from #68 to #72, and retained the #65 power valve. Secondary side - retained the #76 jets and replaced the power valve block off plug with a #65 power valve. Reinstalled the vacuum secondary check ball. Readjusted the idle mixture screws for a max vacuum between 10 - 11” Hg. Results: Great throttle response and a noticeable increase in power thru the RPM range to red line! Making the modifications (from the stock set-up) to connect the vacuum advance to full manifold vacuum and pull in the vac advance at idle has really made a difference. These modification really help to make the 302 come alive! The only issue now is after I drive and park the car, I smell a hit of gas so I must be a bit on the rich side. Does anyone else get this smell? I may try #70 jets on the primary side next. Attached is a picture showing the simple swap between the A.I.R. hose and vacuum advance hose lines (as JohnZ recommended). The vacuum advance is now connected to a full vacuum signal from the t-fitting at the base of the carb, and the A.I.R. hose is connected to the ported source on the carb. The A.I.R. line was blocked with a ¼” section of a plastic golf tee so it actually now a vacuum plug. The lines are easily swapped if necessary for a car show. I still need to dial in the centrifugal advance curve and I should be all set. That may be so with some dial-back lights, but not all. I use an Actron CP-7519 ($70.00), and it indicates EXACTLY the same as my neighbor's $400 Snap-On dial-back light (just doesn't have the digital tach feature, but I use my tach/dwell meter for that anyway). Edit 3/24 - Revised "Sun" to "Snap-On". What are you setting your timing at? The dial backs I've tried ,one was off 4 degrees and the other bounced around at around 4000 RPM .I thought it may have been the chain or the cam moving but when I installed the tape with the light set on zero the timing was steady at all speeds .I have a Actron and a Mac .I have a B28 in a 69Z that I had to open up to get the 15 degrees and one on a L/78 that I have not checked .I'll try it and see what it gives . That may be so with some dial-back lights, but not all. I use an Actron CP-7519 ($70.00), and it indicates EXACTLY the same as my neighbor's $400 Sun dial-back light (just doesn't have the digital tach feature, but I use my tach/dwell meter for that anyway). Yup, I have an old Snap-On MT241A timing light and it has been flawless! If you're asking me, I run 10*-12* initial, with 24* in the distributor (starts at 1000-1100, "all in" by 2800-3000), with the "B28" vacuum advance can, connected to full manifold vacuum. I set my initial at 12 deg BTDC. I have a Sears brand dial back timming, and an older Sun fixed timing light. Last time I checked, they both read the same initial. I'll check them both again. Where is John's write up you are referring to? I can not find it. John Z can you post a pictue of your vacuum hose routing? Here's a photo of my "driving" setup. Note the hose from the distributor vacuum advance can to the tee in the choke pull-off hose (which was already there for the diverter valve signal hose) - that supplies full manifold vacuum to the vacuum advance can. Also note the rubber cap on the original pipe that was connected via a hose to the vacuum advance. The second photo shows the original factory arrangement for show, with the diverter valve signal hose connected to the tee in the choke pull-off hose, and the original vacuum advance hose in place from the end of the pipe (which is a "ported" vacuum source) to the vacuum advance can. Takes less than a minute to change from one setup to the other. John that is very helpful thank you. What do you do with your diverter signal hose when you have the driver setup? Look at the first photo and you'll see the diverter valve signal hose coming up past the emblem on the valve cover - I just tuck it out of the way at the intake manifold (it has a BB in it anyway, as the system is non-functional). Ok that is what I thought, and I have done the samething. I just wanted to make sure that I was not missing anything. I have a follow-up question regarding resetting the centrifugal advance curve via the springs. Does anyone have any experience with the centrifugal advance curve kit #735-4957 from NAPA? This is the kit for the non HEI, point style GM distributors. I have weak springs in my distributor allowing my centrifugal to start pulling in advance at 600 RPM. I need to change the springs to hold the centrifugal from coming in until about 1000 - 1500 RPM. I have a 69Z 302 with the idle set at about 900 – 950 RPM. I purchase this kit recently. The kit comes with three different springs, two different limit bushings, and one set of weights. Unfortunately, neither the kit or NAPA’s web site provide any technical info at what RPM their spring sets allow the advance to start, or what RPM the advance is “all in”. The kit also does not let you know the advance limit on the two bushings. One last question: has any one weighed original vs. aftermarket/replacement advance weights while fine tuning their distributors? I can spend some trail and error time experimenting with this NAPA kit but hoped to “cut to the chase” with other’s experience with this kit. I have weak springs in my distributor allowing my centrifugal to start pulling in advance at 600 RPM. I need to change the springs to hold the centrifugal from coming in until about 1000 - 1500 RPM. I have a 69Z 302 with the idle set at about 900  950 RPM. I purchase this kit recently. The kit comes with three different springs, two different limit bushings, and one set of weights. Unfortunately, neither the kit or NAPAs web site provide any technical info at what RPM their spring sets allow the advance to start, or what RPM the advance is all in. The kit also does not let you know the advance limit on the two bushings. I can spend some trail and error time experimenting with this NAPA kit but hoped to cut to the chase with others experience with this kit. Call Eric Jackson at Vintage Muscle Car 937 836-5927. I have had two carbs rebuilt by him (one for my Vette and one for the Z) and a distributor for the Z. He does a great job and very helpful on the phone. He advertises on the Super Car site. You can work this out yourself if you have a dial-back timing light to "map" the advance curve that results from each change/combination, but it's very tedious. A better approach is to have someone with a Sun machine set the curve up to your specs; Jerry MacNeish does this work all the time, and knows the ins and outs of the OEM weights and springs vs. the aftermarket kit parts. Apparently the listed vac cannisters are getting a little tougher to find. I scored this one on ebay. Lynn, there are a lot of parts that cross reference to the original NAPA part, but instead of listing all of them, just go to your favorite auto parts store and tell them you need one for a 1973 Camaro 350 2BBL. Just wanted to add some current info on the vacuum advance can for the 480 distributor. I am almost done rebuilding the 302 for my '69 Z and after some research realized that this was an important part of my engine assembly. Even though my car ran fairly well previously, I tested the existing B28 vacuum can and it did not function properly (per the specs provided via this forum - Thanks!) and wouldn't hold advance with vacuum applied. So off to the parts stores I go with my parts number list courtesy of CRG. Most stores (O'Reillys, PepBoys, Napa, Autozone and a couple small stores) did not have the listed part numbers, but were nice enough to order me an advance based on the application (the only way they really know how to look up parts on their computer nowadays). Man I miss the old days with parts books and interchanges and spec books. Of course each one of those were incorrect, with some being B1's, B25's and one with no number stamped in it at all. While I was at Autozone examining yet another incorrect part, I asked them to see if there was an "1810" in their brand parts list (Duralast) and there was - a "DV1810". Of course they had no specs on this item but I ordered one anyway - at $11.99. It came in today and low and behold, it has B28 stamped in it. Eureka. Oddly, it didn't even come in a box - only a FedEx bag. During this adventure I checked some of my other Z distributor vacuum advance units. Turns out there was a B1, a B20, and another bad B28, so I ordered three more today when I picked up the first B28. Sure hope they are the same upon arrival. Once my distributor is set up on the Sun Machine, I'll try to post the resulting performance (vacuum and mechanical advance stats).